I live at the corner of Balboa and Great Highway in San Francisco. Over the last year, there's been a ton of construction on Great Highway and on Balboa. Sadly, the folks doing the construction didn't do good planning or design. This is frustrating. If it looks like it was hit by a truck... it was. The end cap of the divider is there for a good reason. It keeps pedestrians safe when they are standing in the middle of the road. But, the end cap itself is in the blind spot of the A-pillar of many cars and trucks. This means that once or twice a day, somebody hits it. The blind-spot issue is exacerbated by the dashed yellow line (one that looks like a lane divider) that leads right into the end cap. What happens when someone hit it? Mostly they blow out a tire. But as you can seen in the picture, somebody hit it and it destroyed the underside of their car. Yep... oil and water and car guts all over the street. $10K worth of damage. No amount of putting markers on the end cap will address the issue. The end cap is in the driver's blind spot. The easy way to reduce the issue is to re-paint the dashed yellow line to go from the center of Balboa to the center line on Great Highway. That will at least give some guidance to drivers to avoid the end cap. A better solution would be the above paint solution and also moving the end cap 5 feet in. Yes, that will reduce the safety zone in the boulevard, but it will keep cars from running into an end cap the drivers can't see. 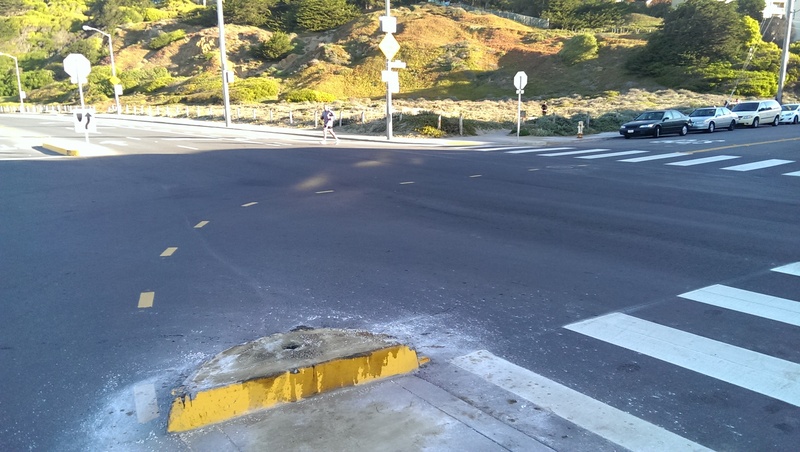 Down a block on Great Highway, there's a pedestrian cross-walk where Cabrillo and Great Highway used to intersect. Some complete moron (and I'm being kind here), put big, tall rocks on the Great Highway divider. What effect do the rocks have? You can't see short people or people on bikes waiting to cross Great Highway at the pedestrian cross-walk. Cars are supposed to stop for pedestrians at the cross-walk, but you can't see short pedestrians or folks on bikes because the rocks block your view. AND the pedestrians can't see the cars, either. I've got kids and I won't let them cross at this intersection. What can be done? Remove the big rocks. Simple. There's lots of "traffic calming" and pedestrian safety stuff happening on Balboa Street as well... all with similar levels of disregard for real safety. Yep. 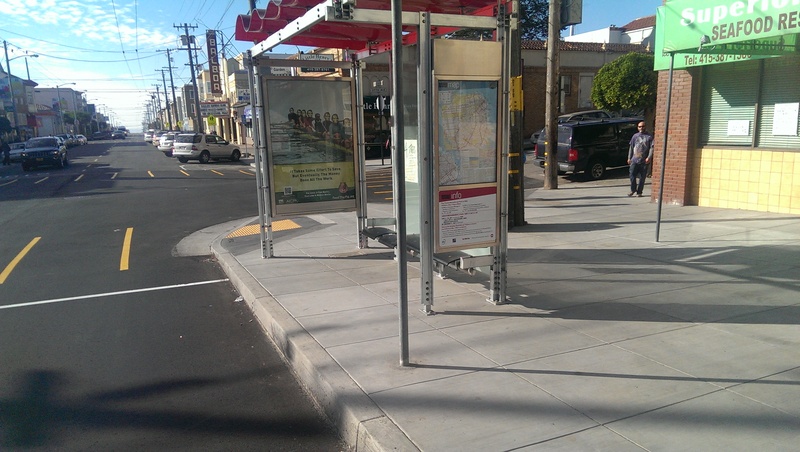 The bus stop is built right up to the curb and right up to the crosswalk. This means that if you're trying to cross at the crosswalk, you can't see if there's any oncoming traffic without stepping out into the street. And the situation is worse for people in wheel chairs. So, this crosswalk got radically more dangerous because it's a blind crosswalk. What can be done? Move the bus stop 3 feet back. I am a fan of infrastructure projects. I believe in trying different things to make the streets safer for pedestrians, bicyclists, and drivers. But I can't understand that San Francisco is thinking. It's dead-bang obvious how poorly executed these "safety improvements" are.